Innovations in CNC machining, additive manufacturing and casting technologies are giving companies, prosumers and consumers an unprecedented level of design options. However, with so many technologies on the market, the question remains: how are they faring in terms of growth and which industries are employing them most prominently? Here, we take a look at the growth trends from CNC machining, 3D printing and vacuum casting for 2019 and look onwards for forecasts. Automotive, aerospace and metal fabrication companies are the most prominent users of automated, subtractive machining technologies. Other prominent industries include construction, power and energy. The US is the single largest market for automotive tools and is set to grow further due to a number of factors (population size, govt incentives and consumer base etc.). 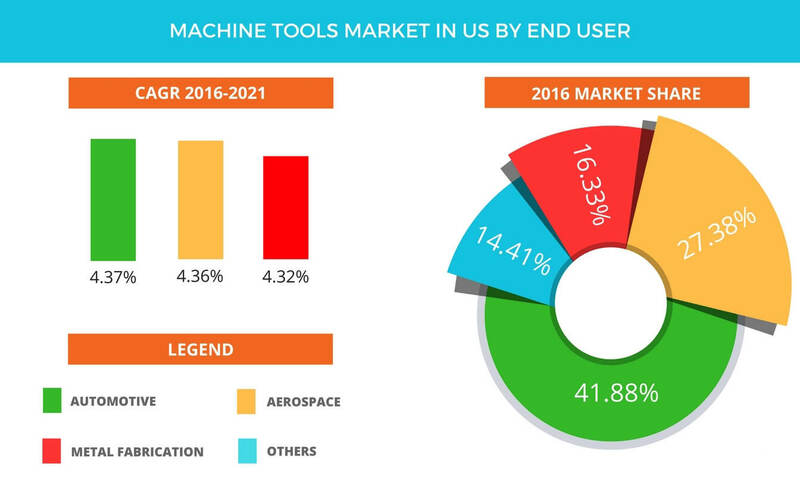 The top vendors of machining technologies (CNC and laser) highlighted by Technavio’s industrial automation market research analysts in this report are Dalian Machine, DMG MORI, Haas Automation, JTEKT and Komatsu. CNC machines are being used for, as one would expect, a variety of purposes including milling, drilling, tapping, and boring. While APAC regions are currently using CNC controllers the most, the European market is expected to undergo a lot of growth owing to technologies advancements and investments. Key global players in the market include Bosch Rexroth AG (Germany), DMG MORI CO., LTD. (Japan), Fagor Automation (US), FANUC Corporation (Japan), Haas Automation, Inc. (US), Hurco Companies, Inc. (US), Mitsubishi Electric Corporation (Japan), Okuma Corporation (Japan), Siemens AG (Germany). The CNC controller market was specifically valued at USD 2.86 Billion in 2016 and was expected to grow at a CAGR of 3.8% between 2017 and 2023, and certain estimates expect it to rise to a value of USD 3.70 Billion by that end period. 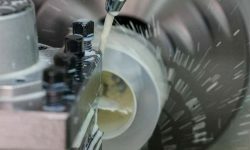 Increase in the adoption of industrial automation in the manufacturing sector, ability to reduce operating cost and rising demand for mass production across end-user industries are the key factors driving the growth of the CNC market, according to ‘Markets and Markets’. More specifically, 3-axis CNC machines are expected to hold the highest share of the market during this period. With 3-axis machines holding the highest level of use within the industry, 5-axis machines are also coming forward and are expected to grow from now onwards to 2023. The automotive industry is most likely to maintain its dominance in CNC usage. Innovation, the need for quick production and better quality are the main factors propelling it forward, not just in the production of cars, but also in the defense and aerospace industries. Another estimate shows that it would mark an increase by 4% by 2021. It’s especially interesting as the market history showed that many had thought the machining industry had peaked a while ago. According to report by Gardner Business Intelligence “U.S. machine tool industry, as measured by machine tool orders (USMTO), peaked at 7.4-percent growth in September 2014, and afterward experienced a trough with unit volumes down 19.4 percent in July 2016”. In terms of printer manufacturers, the major change up to 2018 has been the shift towards pricier systems. The main segment growth is the number of companies that produce printer in or over the $5,000 dollar range, with firms climbing from 135 manufacturers to 177. In comparison, the companies producing machines below this price range has decreased, however the overall market is on an upward trajectory in terms of sheer revenue and investment. It is worth noting that due to increased year-on-year adoption, it is difficult to keep an exact track of what industries are using 3D printing. However, aerospace and defense are definitely among the most prominent users. By 2018, 64% of A&D companies are using 3D printing in production, leading all other industries included in the survey. Nano Dimension’s own research showed that in the electronics industry, 3D printing multi-layer PCBs and flexible electronics are the most popular uses. 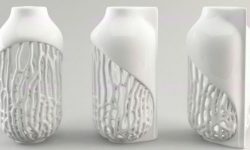 Another finding shows that the industry’s primarily interests in applying 3D printing are for accelerating product development and foster innovation. The medical industry has been employing 3D printing for quite some time. According to the Harvard Business Review (2015), the U.S. hearing aid industry converted to 99% additive manufacturing in less than 500 days. Similarly, dental 3D printing is still one of the most prominent medical uses, with companies like ClearCaps using them to produce dental aligners for high volume manufacturing. According to Sculpteo, 55% of companies predicted they might be spending more on 3D Printing services and solutions in 2017. A year later, Sculpteo found that 70% of companies increased their investments in 3D printing in 2018 versus 49% in 2017. Overall, the increasing level of investment is a good sign of health for the technology. These investments go to a number of possible functions that 3D printing serves within these companies. In 2017, according to Sculpteo’s survey of companies, 3D Printing was mainly used to accelerate product development (28%), offer customized products (16%) and to increase production flexibility (13%). 2018 marked the highest sales of materials for polymer powder bed fusion. The technology reached a value roughly within the region of $400 million dollars. 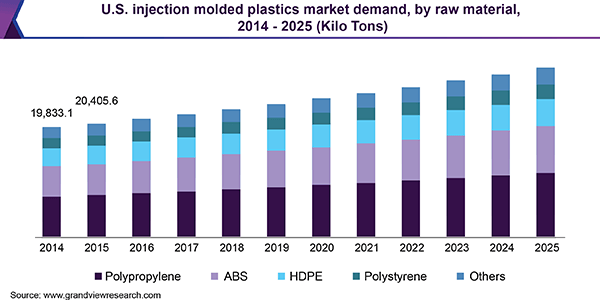 While plastics are still the most common printing material, the rate of growth had been stagnating up until 2017, where there was a sudden growth in industrial strength polymers. Similarly, metal materials grew 41% throughout the year. By 2020 the overall 3D printing market is expected to total $15.8 billion for all AM products and services worldwide. The Wohler’s report expects revenue forecasts to climb up to $23.9 billion in 2022, and $35.6 billion in 2024. On the whole, the future looks brighter for the industry with year-on-year growth higher than 40% for the next few years. Another interesting stat is the number of companies that now consider themselves “3D printing first” and use the technology as their primary mode of production. The number of these companies jumped from 15% to 22% from 2017 to 2018. 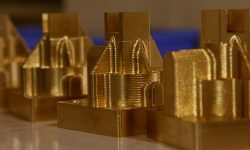 In that same year 36% of companies surveyed by Sculpteo were using metal printing, up from 28% by previous calculations. Among the entire crop of 3D printing technologies, powder bed fusion is expected to hold the largest share up until 2024. The aerospace, automotive, healthcare, and engineering industries most commonly use technologies such as direct metal laser sintering (DMLS), electron beam melting (EBM), selective heat sintering (SHS), selective laser melting (SLM), and selective laser sintering (SLS) for the development of functional parts. The key manufacturers within the technology are Alcoa Corporation; Walbro; Consolidated Metco, Inc.; Dynacast; Gibbs Die Casting Corporation; Bodine Aluminum, Inc.; Ryobi Ltd; Aluminum Corporation of China Limited; Martinrea Honsel Germany GmbH; Endurance Technologies Limited; and Alcast Technologies. The die casting market has fairly large in the automotive industry. Their main interest is in producing highly durable die cast parts. Industrial machinery and piping manufacturers are increasingly employing die casting as well, along with growth in the aerospace and defense industry in the past few years. Another recent advent is the use of stronger aluminum components in agriculture and medical devices has also witnessed an increase. Aluminum is the most widely used metals used with casting technology. 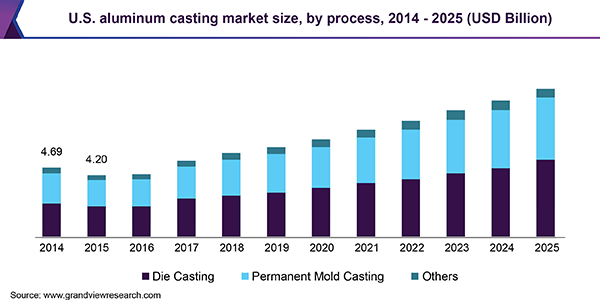 Worldwide aluminum casting market was estimated at USD 47.1 billion in 2018, with an anticipated CAGR of 9.1% from 2019 to 2025. This upswing in the use of aluminum is due to automobile manufacturing and heightened demand from the building & construction sector in Asia Pacific has boosted the growth of the market. Another promising and quickly growing segment for end-use aluminum parts is in the industrial sector. The growth of the segment up till 2025 can largely be attributed to the modernization of traditional agricultural countries including India and Brazil. 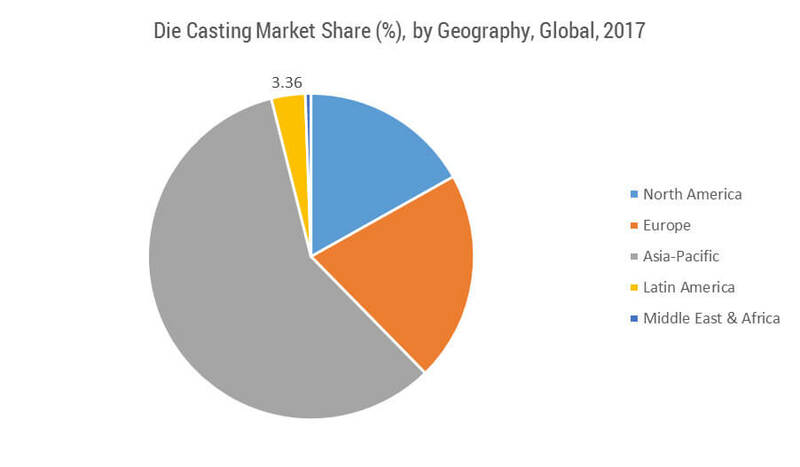 The die casting process accounted for approximately 53.0% of the market revenue in 2018, owing its popularity to the high-volume production. High-pressure die casting (HPDC) accounts for 71.0% of pressure-die process, which allows for higher production rates within various industries. In 2017, the global die casting market was valued at USD 62.87 billion, which is projected to reach a value of USD 93.87 billion by 2023. The market is poised to register a CAGR of over 6.93% during 2018-2023 (the forecast period). Asia-Pacific is, by far, the largest market for die casting, globally accounting for over 58% share in 2017. Further growth is imminent in the Asia-Pacific magnesium alloy die casting market for many new start-up companies because of an increasing preference of end users toward lower production costs. Established companies are posing a great challenge in terms of technological, reliability, and quality issues, which is leading to mergers and acquisition signed between smaller and established companies. The two major markets for the die casting industry are the automotive industry in first place and the housing industry in second. Both these industries form a good barometer for the overall health of the casting industry. Light vehicle sales in 2016 reached 17.55 million units, making it another good year in a row despite speculation that it may not match 2017. It has held steady, despite growth from 2016 to 2017 being higher. At a global level, approximately 60.0% of all cast products in the market are directed towards the automotive industry. Recently within the North American market, a boost in die casting technology usage within the automotive field has been attributed to EPA regulations on miles per gallon for vehicles. This may have contributed to unforeseen increases. As per the new requirements, manufacturers sought to make new vehicles lighter, which as a result, increased die casting usage. The step by the EPA, to raise the mile per gallons standards to 35.5 mpg by 2016 and then 54.5 mpg by 2025. Europe is also projected to post a CAGR of 7.1% in terms of value from 2019 to 2025, particularly when it comes to Germany, France, Italy, and Russia. Metal injection molding technologies have been adopted by automotive & aerospace, consumer goods, and medical device manufacturers, which certain studies believe has led to the growth within the sector over time. It is expected to experience more growth considering demand for smartphones & other electronic products, as several components such as lightning connectors, phone flip slider & fiber-optic parts are produced using MIM machines. In the plastics department, the main adopters of injection molding have also been automotive and medical, followed by the construction, medical and packaging industries. There are many industries, such as automotive are replacing, steel with plastics for lighter weight. This is causing an increase shift from one to the other in terms of production preferences. Key players in injection molding include Dynacast, GKN Plc, Britt Manufacturing, Dean Group International Ltd., Cypress Industries, Sintex, CMG Technologies, Indo-MIM Pvt. Ltd., Real Technik AG and ATW Companies. When it comes to plastics, the main companies are BASF, Dow Chemical Company, DuPont, and HTI Plastics. Companies adopt injection molding for faster processing time, elimination of secondary operations, and better tolerance levels of final products. I also allows for companies to minimize finishing and post-processing in their operations. Additionally, it’s also cost-effective, particularly in comparison with various other fabrication methods. The medical industry is also making use of injection molding in brackets, drug delivery devices, joint replacement equipment, and various implants. In terms of plastics, there is a recent volatility the market price, which is likely to affect the growth. Raw materials like benzene, ethylene, propylene, and styrene are going through fluctuations, along with coming under fire for environmental concerns about their disposal. This makes the market uncertain in the future. This has, however, propelled companies to invest in various alternative biodegradable materials in the past few years. Asia Pacific is leading in both categories of injection molding. It holds 37% of the market in terms of plastic molding, possibly due to packaging, cellphones and consumer goods. North America emerged as the second major consumer and is expected to grow at a CAGR of 10%. Europe was another major market for injection molded plastics with a total demand estimated to reach USD 45.29 billion by 2025. The global injection molded plastics market size was valued at USD 325.69 billion in 2018. It is expected to expand at a CAGR of 5.7% during the forecast period. Similarly, the global metal injection molding (MIM) market size was valued at USD 2.1 billion in 2015 and is projected to grow at a CAGR of 11.9% from 2016 to 2025. Increased product spending in Brazil, China, India, Mexico, Russia and South Africa is poised to help create more growth. Both in plastics and in metals, Increasing demand for lightweight & smaller automotive parts is driving up opportunities for MIM technology. This is also true of high strength components in engines & electronic systems for the automobile industry. Optical clarity, biocompatibility and cost-effective methods of production are all expected to drive demand in medical industry. Health and medical fields are expected to achieve a CAGR exceeding 6.3% reaching a net worth of USD 40.49 billion by 2025. The main sources for the data used in the article are the Wohler’s report, Sculpteo, Grand View Research, Technavio, Reuters, the North American Die Casting Association and Mordor Intelligence.